All Hova-Bator incubators are 18 ½” x 18 ½” x 9 ½”. Without a turner, each holds about 50 duck or chicken eggs or 130 quail eggs. All Hova-Bators come with a sanitary plastic liner (item # 1765). Models 1602N, 2365, & 1583 come with thermometers. Models 2370 & 1588 have a digital display. Automatic egg turners must be purchased separately. Prices on GQF Hova Bators and turners are subject to change without notice. Hova-bators are drop-shipped from GQF. Shipping charges for Hova-Bators are posted below. To determine your shipping zone, refer to the zone chart. 1588 The Genesis Hova Bator picture window incubator has a pre-set electronic thermostat. It is also equipped with a digital control center which displays the temperature & humidity. 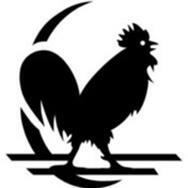 It is UL/CUL listed. 12 Volt DC power supply plugs into 110 volt outlet. 2365 Circulated air Hova-Bator has a 12 volt wafer thermostat. The power supply operates on 100 to 240 Volt AC. The unit has a fan so the incubator will hold a more uniform temperature & a compact heater which allows two viewing observation windows. TUV listed for classroom & laboratory use. Only US plug & cord set are supplied. 2370 Electronic thermostat incubator with an easy to read display of temperature (either Fahrenheit or Centigrade) with push button controls. It can operate wither as a circulated air incubator or it can be operated as a still-air incubator so reptile eggs can be set. Has two observation windows. Display unit is pictured below the 2370 picture. 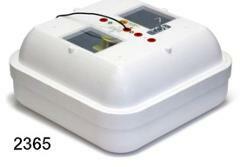 1583 The top has a large clear plastic window for viewing the incubation and hatching process. This window is double plate plastic with air space insulation to help eliminate moisture build-up. The operating system is a wafer-thermostat. 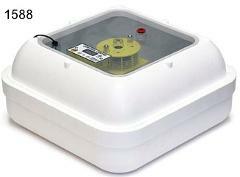 The circulated air incubator is 100 volt, 25 watt. 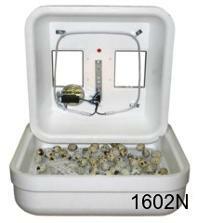 1602 Still-air Hova-Bator Incubator has 2 5” x 4” observation windows; comes with wafer & thermometer. Operational temperature range - 70 to 110º F. Using an egg turner is not recommended for this model. Everything you need to start setting and hatching eggs. This kit includes 30 Bobwhite Quail eggs, a 1610 turner with both the universal and quail egg racks and the Genesis 1588 electronic thermostat Hovabator. Hatching instructions included. Free shipping on this item in the 48 contiguous states only. 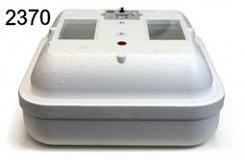 Save $12.00 when you purchase the 2370 incubator and 1611 combo. Information about the incubator and turner are on this page. Instructions for operating the incubator are included. Drop-shipped from GQF. Mfg. Price does not include shipping. See the shipping charges on the chart on this page. 1611 All turners are TUV listed. 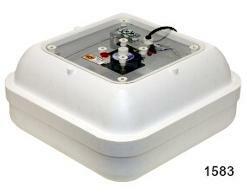 They are 110 Volt AC, measure 15” x 15” x 3”, and can be used with any current production Hova-Bator. Egg turner holds 41 eggs - any size egg from a partridge egg to a duck or chicken egg. 1610 Turner pictured with quail racks in place has 6 universal & 6 quail egg racks which will hold up to 120 quail eggs. 1614 Goose turner holds 19 goose eggs. 1730 Allows the 1588 or 2355 to be plugged into an automobile cigarette lighter. 1729 Cord & clips allow the 1588 or 2365 to be attached to a 12 volt battery. 1696 Set of 6 replacement quail racks for 1611 turner produced before May, 2018 (no turning framework or turning motor). 1686 Set of 6 replacement chicken racks for 1611 turner produced before May 2018, (no turning framework or turning motor). The top diagram shows the 3007 wafer. The threads are on the inside of the extension on the wafer. 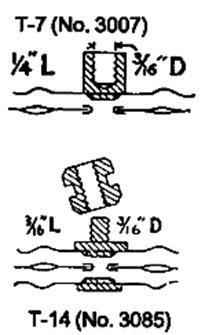 The bottom diagram shows the 3085 wafer. The threads are on the outside of the extension on the wafer and a removable nut screws onto the extension. Each wafer has its own bracket & a 3007 wafer will not work with a Brower bracket & a 3085 wafer will not work with a GQF bracket. If you are not certain which bracket you have, purchase the 3122 wafer, switch, adjusting rod, & bracket.